Yes the firmware for this router is global. You can always double-check at https://tsd.dlink.com.tw. 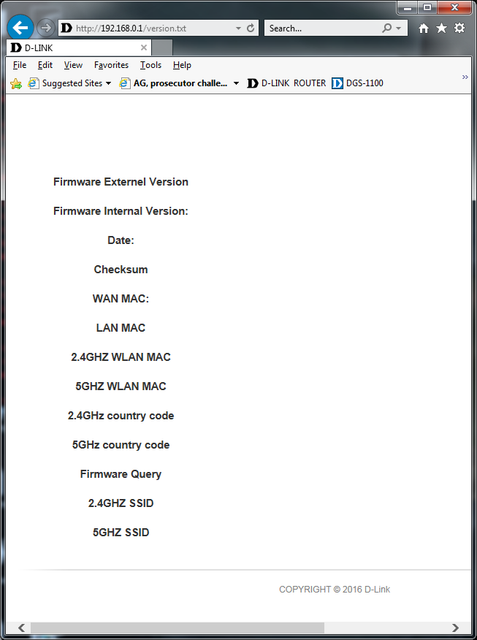 All firmware is posted here so you can see if any files have a country code. Hey thanks that url is awesome... i have to flash Firmware:DIR-878_A1_F/W:v1.10 right? 1.DIR-878 Config file - PM me when you have this file and I will give you an email address to send it to. 2.DIR-878 detail version (http://192.168.0.1/version.txt) - Please provide screenshot. 3.Draw a complete topology for us checking further. Need ISP, modem model, and what is connected to what and how it is connected (wifi or ethernet). Include ANY switches, hubs, etc. Current FW is v1.10, do they want this for v1.10 or when we have v1.12 loaded? Mines NetGear CM1100 cable modem only>DIR-878<>two xbox one's connected via CAT6 to the back of the 878. I have a D-Link DGS-1100 switch connected to a free port on the 878 and a different wireless AP device connected to the last available LAN port on the 878. The wireless is shut OFF on the 878. From the DGS-1100 I have an HP-1400-24 port and a HP J9794A-8Port non managed switches connected to the DGS-1100. All of the rest of the house hold devices and other switches are connected after the HP-1400 and J9794A switches. Xboxes are not connected to any switches. They are direct with the 878 router. Not seeing any value information. Tried two different browsers. I'll load up v1.12 and factory reset and post what I find there. I was able to downgrade to v1.10 like you suggested. When i downloaded the fw onto my pc, it gave two files one called encrypt and the other unencrpt. The unecrypt wouldn't flash on the 878 so i tried the encrypt one and it did downgrade to v1.10 successfully. Note: I'm a little tight on time so didn't have the patience to factory reset for now. However for now atleast the xbox one x started showing open nat. This was with instant on turned on. PS4 Pro has held on to it's open nat within games which is a good sign. So i'll check back tomorrow morning again if it loses open nat like it used to do overnight with v1.12. Haven't been able to google the difference between these two files though. Yes, you only need the v1.10 file to downgrade from v1.12. I have tried both factory reset and no reset after downgrading to v1.10. OPEN NAT on both consoles. D-Link is reviewing this currently. Hopefully they can figure out what happened between v1.10 and v1.12 and come up with a fix in next FW update. Furry, HQ is working on this and thanks for the config file. Hopefully they can figure it out and fix it. I assume they will send me a beta firmware to test but will prob take a little time as you know. Firmware 1.10 added encryption to the firmware on the router for added security. The unencrypt file is needed if you are using an old firmware version to add the encryption to allow v1.10 and higher to be installed. Since you already had 1.10 and 1.12, the encryption is already added. The only difference between 1.10 and 1.12 was the added support with the D-Link WiFi app and they fixed an issue for Australia. Thank you Sir. Sounds like I may have to get another router for my Bro in Law then. LOL this was supposed to be his when he got his new place which he has now. He's waiting to move in. I'll find him something else. Not like I don't have a boat load of routers that I can't part with. Maybe the 3902 would be good for him. We still have to check out the new home for ISP and router placement. Told him to let me know so we can take a look. Thanks any idea how soon the fix could be out? Not that I'm too eager. If v1. 10 works as well as it did for Furry I'll be pretty alright with it. I do notice v1. 10 is quite a bit faster at establishing a pppoe connection after a reboot. Fixes can take a few weeks generally. Depends if the fix is simple or requires a lot of code rewrite. Continue to use 1.10 if it is working for you. 1.12 did not have any security fixes or other complex changes. Left the xbox asleep overnight in Instant On mode. Checked today morning. Still Open NAT. Thanks furry and greenbay for suggesting this "downgrade"